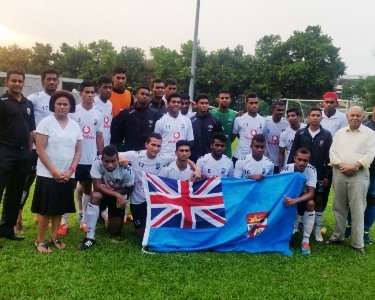 After winning their first match against the Malaysia U23, 1-0 on Tuesday, the Fijians started the match in high spirits and played more improved football. Rewa striker Iosefo Verevou scored the opener midway in the first half after heading in a Narendra Rao corner. The Malaysian side leveled scores through a free-kick which deflected off a Fijian defender and landed in goal just from outside the penalty box. Both teams went to breather tied 1-1. The Frank Farina coached side came in more organised in the second spell with more constructive structure which saw midfielder Rao scored the second goal for after connecting well with a well set up move from the back. Verevou had the chance to score his second for the night when he beat the entire defence but his final attempt was deflected off the goalkeeper. Fiji lost concentration in defense in the dying minutes of the match which allowed Malaysia to walk away with a point leveling the score 2-2. Vodafone Fiji U20 coach Frank Farina says the Asian tour has been invaluable in the preparation for the FIFA U20 World Cup. “To have five quality Internationals against very good sides is something that we just couldn’t get in Fiji or Oceania and these sorts of tours are things we need more to improve as a team, “said Farina. “It shows us just what we need to improve on to bridge the massive gap between Oceania and the rest of the World. “The skills and technical levels shown by Asian players shows us that we in Fiji and Oceania have a lot of work to do at the Development level of young players. “But I believe the experience of this tour plus others to come and then the world cup will benefit Fiji Football for years to come. “These boys will have more International experience than any other players in the history of Fiji football.